MYKITA eyewear collections have won a variety of design awards since the company was founded in 2003. That doesn’t just apply to the products themselves; the annual campaign, the MYKITA 8 anniversary book and the MYKITA MYLON campaign have likewise all won accolades. The MYKITA sunglass models STUDIO 1.1 and STUDIO 1.2 were both awarded the Red Dot Award for Product Design in 2017. Since 1993, the Design Zentrum Nordrhein-Westfalen honours the most important trends in Product - and Communication Design. The LITE model NUKKA was awarded the Red Dot Award for Product Design in 2016. Since 1993, the Design Zentrum Nordrhein-Westfalen honours the most important trends in Product - and Communication Design. Both MYKITA + MAISON MARGIELA's frame MMDUAL001 as well as the MYKITA Shop Berlin West received a “Special Mention” in the category for "Exceptional Design Quality". The board of design annually honours high-calibre products and projects from the world of product and communication design with the German Design Award. MYKITA + MAISON MARGIELA's frame MMDUAL001 received a “Special Mention” in the “Lifestyle and Fashion” category. MYKITA Shop West received a “Special Mention” in the “Retail” category. The model MADELEINE from the MYKITA / DAMIR DOMA collection won the silver A’ Design Award in the category “Jewellery, Eyewear and Watch Design”. A’ Design Award and Competitions recognises excellent design, design concepts and design oriented products and services. The MYKITA Shop New York picked up first prize in the "Interior Design" category. The DDC was established in 1989 offering a national and international platform for an interdisciplinary exchange and development of “Good Design”. The board of design annually honours high-calibre products and projects from the world of Product and Communication design with the German Design Award. The 2015 Good Design Award (USA) in the field of “Product Design” went to BRADFIELD, a frame designed by MYKITA / DAMIR DOMA. The Good Design Awards is an industrial design program organised annually by the Chicago Athenaeum Museum of Architecture and Design, in cooperation with the European Centre for Architecture, Art, Design and Urban Studies. The Good Design Award has been given to outstanding designs in the pursuit of prosperous lives and industrial development. The 2015 Good Design Award (Japan) in the field of “Product Design” went to BRADFIELD, a frame designed by MYKITA / DAMIR DOMA. The Good Design Award Japan was first introduced in 1957. Since then, the Good Design Award has been given to outstanding designs in the pursuit of prosperous lives and industrial development. The high-profile jury for the 2015 International Design Award (IDA) selected the JIRO model from the MYKITA MYLON collection for first prize in the "Product Design" category. The frames comprising the MYKITA MYLON COLLECTION have been acclaimed for their state-of-the-art design, low weight and extreme durability. The International Design Award has been honouring intelligent, sustainable and interdisciplinary design since 2007. The jury of the German Designer Club honoured several MYKITA projects in 2013. The MYKITA MYLON film picked up first prize in the Photo/Film category, the MYKITA Brand film won silver in the same category and the model SIGUR from the LITE collection was honoured with a GUTE GESTALTUNG 14 (GOOD DESIGN 14) Award in the product category. The DDC was established in 1989 offering a national and international platform for an interdisciplinary exchange and development of “Good Design”. MATERIALICA Design + Technology Award presented MYKITA MYLON ¬– a material many years in research – with the Gold prize on account of its high degree of innovation and sophisticated design criteria. Since 2002, MunichExpo Veranstaltungs GmbH bestows the MATERIALICA Design + Technology Award annually. The winners of a MATERIALICA Design + Technology Award display an ability to stand out with excellent design in the material-driven field of technology. MYKITA MYLON received a “Special Mention” in the “Lifestyle” category for particular design quality. The board of design annually honours high-calibre products and projects from the world of product and communication design with the German Design Award. The model BASKY from the MYKITA MYLON collection won the silver A’ Design Award in the category “Jewelry, Eyewear and Watch Design”. A’ Design Award and Competitions recognises excellent design, design concepts and design oriented products and services. The MYKITA EIGHT book won the 2013 iF communication design award in the ”corporate communication” category. The iF award has been a prestigious hallmark of top-calibre design ever since its introduction in 1953. 8 comprises a retrospective of the last eight years of MYKITA.The book provides an insight into life behind the scenes at a modern manufactory, the MYKITA collaborations and takes a look at the evolution of MYLON, a new material developed by MYKITA. The 8th anniversary also prompted MYKITA to invite selected artists to produce original works illustrating their impressions of MYKITA. BASKY won the 2013 red dot design award for product design. While the MYKITA MYLON collection was originally created as a sports eyewear line, the BASKY model adds a new dimension in its reinterpretation of the rounded/oval panto form. The Design Zentrum Nordrhein Westfalen’s renowned accolade has been recognising outstanding international product design since 1955. The MYKITA LITE concept, MYKITA’s lightest metal frames to date, won the German Design Award 2013. The German Design Council bestows the German Design Award annually for outstanding achievements in product and communication design. This design competition aims to identify, present, and reward innovative and international design trends. The MYKITA EIGHT book was awarded with the GOOD DESIGN 12 award in the category marketing communication. The German Designer Club (DDC) is an initiative of designers and “design in mind” companies that spreads the message of design excellence. The Club was founded in 1989 and functions eversince as a platform for interdisciplinary designers. 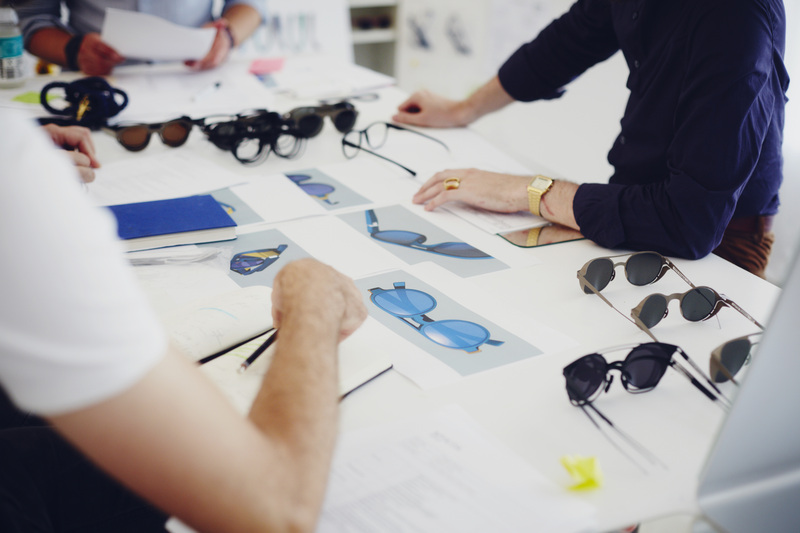 Nominated for the German Design Award 2012, MYKITA’s new patented material MYLON is the result of extensive research. The German Design Award is bestowed annually for outstanding achievements in product and communication design by the German Design Council. This design competition aims to identify, present, and reward innovative and international design trends. The MYKITA MYLON collection was awarded with the 2012 red dot design award in the field of product design. The collection marks the foundation of a new product segment in the eyewear sector: luxury sports fashion. MYLON is a patented, polyamide-based material used for the first time in the manufacture of eyewear. The Design Zentrum Nordrhein Westfalen’s prestigious accolade has been recognising outstanding international product design since 1955. The German Design Award is the country’s highest official distinction in the design sector. An absolute prerequisite for consideration is the company/product in question already having won a national or international award. The 2011 awards saw MYKITA scoop no less than three nominations in the field of Product Design: GRACE from MYKITA’s Collection no1, ODA from the LITE collection and DRIES from MYKITA’s Collection no2. MYKITA’s patented material MYLON, the result of extensive research was awarded with the iF material award 2011 in the category „process“. The Germany based iF International Forum Design GmbH first presented the iF material award in 2005, and today has become an important mouthpiece and trends barometer in the area of materials. MYKITA’s LUXE model JOHANNES was awarded with the 2011 red dot design award in the field of product design. LUXE is MYKITA’s definition of state-of-the-art luxury eyewear with precious metal coatings such as platinum and white gold as well as natural nose pads and temple tips made from buffalo horn. The Design Zentrum Nordrhein Westfalen’s prestigious accolade has been recognising outstanding international product design since 1955. The 2011 Good Design Award (Japan) in the field of “product design” went to TAKUMI, a member of the MINT collection – MYKITA’s first product line that translates the aesthetic spirit of East Asian cultures into MYKITA's flat-metal concept. The Good Design Award Japan was first introduced in 1957. Since then, the Good Design Award has been given to outstanding designs in the pursuit of prosperous lives and industrial development. The MYKITA EIGHT book was awarded with an “honourable mention” in the graphic design category of the 2011 International Design Award (IDA). The International Design Awards exists to recognize, celebrate and promote legendary design visionaries since 2007. The DRIES model won the 2010 iF product design award in recognition of the new, patented hinge from MYKITA’s COLLECTION NO2. The iF logo, awarded by international experts, honours professionalism and guaranteed design quality; since its introduction in 1953 it has been one of the biggest accolades in the design sector in Germany and across the world. The 2010 red dot design award in the field of Product Design went to ODA, a member of the new LITE collection – MYKITA’s lightest metal frame concept to date. The Design Zentrum Nordrhein Westfalen’s prestigious accolade has been recognising outstanding international product design since 1955. The DRIES model from MYKITA’s COLLECTION NO2 enjoyed an honourable mention in the Product Design category of the 2010 red dot design awards for its new, patented acetate joint (manufactured using metal injection moulding technology). The prestigious accolades have been awarded by the Design Zentrum Nordrhein Westfalen since 1955 as a sign of outstanding international product design. The IDEA (International Design Excellence Awards) is an international accolade awarded by the Industrial Designers Society of America for top-calibre design. The 2010 jury selected the BROOKE model from MYKITA’s Imit metal collection for the Silver IDEA in the Product Design category. The CURT model from MYKITA’s COLLECTION NO2 garnered a nomination in the Product Design category for the 2009 German Design Award. The accolade is the country’s highest official distinction in the design sector. To be considered for the award, companies and products must have already won a national or international award and in addition have been nominated by the German Ministry of Economics and Technology or an equivalent regional authority. The ERIK model from MYKITA’s COLLECTION NO1 model was nominated in the Product Design category for the 2009 German Design Award. The accolade is the country’s highest official distinction in the design sector. To be considered for the award, companies and products must have already won a national or international award and in addition have been nominated by the German Ministry of Economics and Technology or an equivalent regional authority. The CURT model from MYKITA’s COLLECTION NO2 of acetate frames won the iF product design award in 2008; acetate has a long tradition of use in eyewear manufacturing. The iF award has been a seal of first-class design quality since its introduction in Germany in 1953. The ERIK model from MYKITA’s COLLECTION NO1 won the iF product design award in 2007. The innovative functional principle behind MYKITA’s metal-frame line removes the need for awkward screws and soldering with a simple plug-in connection. The frames themselves are ultralight and also enable adaptation to individual face forms. The iF award has been recognising outstanding design since 1953.